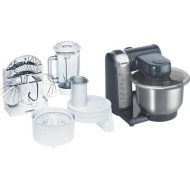 alaTest has collected and analyzed 23 reviews of Bosch Kitchen Machine Food Mixer MUM46A1GB. The average rating for this product is 4.7/5, compared to an average rating of 4.4/5 for other products in the same category for all reviews. Reviewers are impressed by the durability and noise. The price and design also get good feedback, whereas there are some mixed comments about the performance. We analyzed user and expert ratings, product age and more factors. Compared to other products in the same category the Bosch Kitchen Machine Food Mixer MUM46A1GB is awarded an overall alaScore™ of 83/100 = Very good quality. Sturdy base prevents movement while in use. Comprehensive range of attachments included which would cost pounds with other machines. Works very well, not too large for work surface. Doesn't take up toomuch room and very versatile. A bit under-powered - but it does the job! very nice, quiet even on 4 gear, really nice work with.